Stretching from Tropical North Queensland in the north to Central Queensland in the south, there are literally hundreds of islands dotted along the Great Barrier Reef. With a small handful of resorts offering a complete tropical island experience, there's really no better place to escape to for an idyllic and exotic holiday destination. 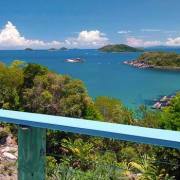 Beautiful, natural and wild and the most northern Great Barrier Reef resort, LizardLizard Island Resort Island is a place reserved for the fortunate few. With 24 powdery-white beaches, 40 luxurious suites, five star cuisine, indulging spa treatments and sensational scuba diving on the Great Barrier Reef, it's little wonder that this beautiful island consistently makes the Top 10 Hotels of the World list. Enjoy secluded picnics on private beaches, explore the ruggedness of the island on a nature trail or simply relax in your luxurious suite. Lizard Island is an ideal couples getaway, accessed by air from Cairns Airport in Far North Queensland. Fitzroy Island is a continental island surrounded by fringing reef, which is the home Fitzroy Island Cairnsto a variety of tropical fish and coral life. One of the most unspoiled islands on the Great Barrier Reef, the majority of Fitzroy Island is a National Island Park which makes for great walking throughout the whole island, including bush walks to the Lighthouse, the Summit, to the Secret Garden and to Nudey Beach. 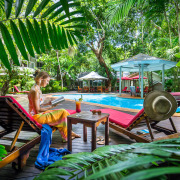 Guest facilities at Fitzroy Island Resort include a restaurant, a swimming pool and spa, swim-up pool bar, conference rooms, function rooms, a cinema, kids' games room and kids' play room. Day Visitors to the island are welcome and well catered for. A council campground is located, next to the beach, only 5 minutes stroll from the Jetty. Fitzroy Island Resort is accessible via a 60 minute ferry ride (about 30kms) from Cairns in North Queensland. Orpheus Island is located just a 25 minute scenic flight from Townsville.Orpheus Island This tranquil island stretches across 11 kilometres of immaculate coastline, and comprises of a pristine National Park and surrounding World Heritage listed Marine Park. 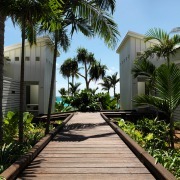 The fringing reef of this Great Barrier Reef Resort is one of the most spectacular and diverse. Accommodation is exclusively available to just 34 guests at any one time; this luxury resort offers absolute seclusion and serenity. Orpheus Island is perfect as a holiday destination, a picturesque wedding setting, or booked in its entirety for exclusive use. The Whitsunday Islands are located in the centre of the Great Barrier Reef, stretching off the coast of Townsville along to Mackay. Whitsunday IslandsThey form the largest offshore island chain on the Great Barrier Reef, comprising of 74 beautiful islands of which just eight of them are inhabited by 9 island resorts. Airlie Beach is the mainland gateway to the Whitsundays, direct flights are also available into Hamilton Island, the largest inhabited island in the Whitsundays chain. 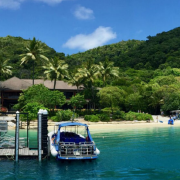 The Whitsundays is the place to be for rich experiences, adventure, discovery and more; whether its eco-style, family friendly, all-inclusive, activity based, food & wine focused or pure luxury you are after, there is a Whitsunday Island experience to suit all. If you're a nature lover, Heron Island really is a special place. Located 89kms off the coast north east of Gladstone, this natural coral cay is situated on the Great Barrier Reef, which means you can snorkel right off the beach. 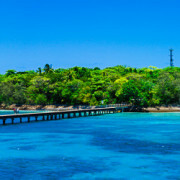 With a myriad of colourful coral and reef fish at your fingertips, it's no wonder that Heron Island is a popular choice for divers, swimmers, and people who love to snorkel.Heron Island The resort also offers an array of choices for those who like to explore and laze on beaches far from crowds. Being an exclusive island for guests only (no day-trippers here) and, with television-free rooms and no mobile phone reception, it's ideally positioned to take you â€œback to natureâ€. Turtles return here year after year to lay their eggs and guests can gather just outside their rooms to watch the hatchlings make their way to the water. The resort caters to both couples and families and has approximately 100 comfortable rooms, all with ceiling fans and either balconies or terraces.